It’s edible, a member of the mint family and ornamental. Grown for over 5,000 years, it flavors foods around the world and is well-known in many household kitchens… Have you guessed yet? 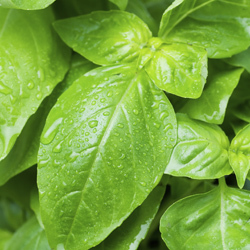 A flavorful ingredient of foods from Italy to India and Thailand and America, basil adds flavor and flair to any recipe. Add fresh or dried basil just before serving for the most intense flavor. However, the kitchen isn’t the only place it reigns as king… Give it a throne in your garden, too! Like other mints, basil is easy to grow. Choose young, bushy, compact plants that show no signs of diseases or pests. Plant in full or partial sun, in well-draining soil and provide adequate moisture. As an annual, it’s also easy to grow from seed, just follow the package instructions. The most difficult decision about basil is deciding which basil you want to grow and eat. The basil family, Basilicum, has a natural variety of colors, growth shapes and fragrances. Plant breeders complicated the decision by creating over 30 hybrids commonly used today. For ornamental gardening use, four “shapes” are commonly available. All are deliciously edible. Sweet Green Basil: 2′ tall, with large leaves and white flower spikes. The clove/anise taste is typical of many types of basil. Others in this group include lettuce-leaf, Genovese, Thai (spicy) and the intensely fragrant and flavored Siam queen. Dwarf Basil: Up to 12″ tall, small leaves, white flowers. This group includes well known Spicy Globe and Boxwood basil (perfect edging plants due to rounded growth) and Green Bouquet. 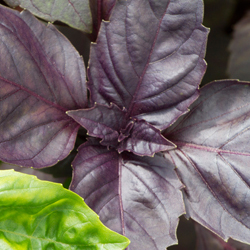 Purple-Leafed Basil: Favorite varieties include Dark Opal, Purple Ruffle and Red Rubin, all with “fancy” leaves, very aromatic, with pink to lavender-purple flowers. Scented-Leaf Basils: This group includes varieties of stronger aromas. Lemon basil (gray green leaves, white flowers) is aptly named as are cinnamon basil (dark pink flowers), and anise basil (blue purple flowers). Basil, especially the purple-leafed, is wonderful in containers. Design as you would with any ornamental. Don’t overlook the value of placing a container near the BBQ and kitchen for easy use while cooking. It’s said that planting basil, especially aromatic varieties, around the patio or deck will deter flies… It certainly can’t hurt! 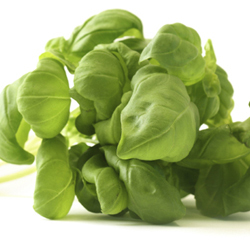 Used throughout the world with different regional foods, basil truly reigns in many different cultures and cuisines. 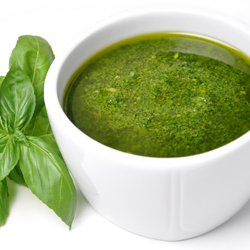 Although pesto is probably one of the best-known uses here in the United States, basil is great in soups, sauces, pastas or in salads, vegetables and martinis. Remember to harvest before flowering for the best flavor. This also keeps the plant bushy and compact. Simply cut the entire stem just above a pair of leaves to promote new shoots. If you plan to use some leaves as garnish, cut with scissors to reduce bruising. Store unused basil in the refrigerator to retain its flavor and freshness. Extra basil can easily be dried for future use. Cut the plant at ground level, hang upside down in an airy room and let dry. After it’s fully dry, remove the leaves from stems and store in airtight jars away from direct light. Did you know using basil is also very good for you? For many reasons basil is called the “holy herb” in other cultures. Research now shows it has strong anti-oxidant, anti-inflammatory and anti-bacterial qualities. Additionally, it is rich in essential nutrients, minerals and vitamins including beta-carotene, vitamins A and K and iron. Need we say more? Add basil to your healthy, delicious diet today!